After speaking with my father-in-law about his new kayak, I figured I would sit him down and ask him questions about this pretty awesome kayak that he received as a present. I wrote his answers down and came up with this pretty accurate review, so you know whether or not this is what you want to get when you’re thinking about hitting those rivers and streams! A canoe was all I owned for many years. 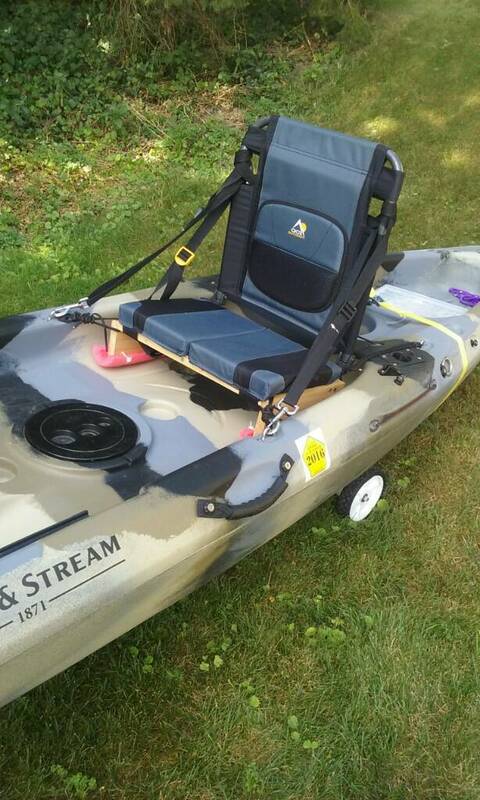 My wife purchased a 12-foot kayak for me for our anniversary from the Field & Stream store in our area. I never thought that I would ever own one, since I am a tall and somewhat heavy individual, thinking that I wouldn’t be able to get in it or stay afloat. Boy, was I wrong. I desire to be on the water all the time, mainly because I love to swim and fish and this kayak proves to come in as the top dog when it comes to human propelled watercraft. Even though this kayak is called a “fishing” kayak, it can be used for any kayaking adventure you can come up with. As I was saying about my leeriness of owning a kayak, I figured getting in was going to be rough, being a large man. The opening is 45″ x 18″ and is definitely large enough for my 270 lbs. The seat and backrest, which are adjustable, are cushioned for comfort and the sides of the cockpit/opening are cushioned for your legs to rest against while you paddle. There are two fishing rod holders with leashes so you can’t lose your favorite fish pole. It also comes with a removable storage pod that has a quick lock hatch that keeps stuff dry. The storage pod is very handy and was a good idea on their part to incorporate. I have stored my lunch in it, and also some camp equipment in it when I took it down river camping. You could also use it to carry the fish you’ve caught during the outing. There are rear and foredeck bungee cords very useful in storing items that may get wet. There are cupholders and a built-in front console. Another item that I liked was the adjustable foot pedals. which I didn’t realize until later that they help with balance. It doesn’t come with a skirt, but you can purchase it separately. You do need to purchase a paddle. The paddles come in different lengths depending on your height. Paddle length is determined by standing straight, lift either arm up like reaching for something and paddle should reach from floor to fingertips or more. The Eagle Run Fishing kayak has a carrying capacity of up to 500 pounds, which would be your body and gear combined. It is 12 feet long and 29 inches wide. The carry weight of the kayak itself is only 60 pounds, which makes it very portable. It is made up of 100% polyethylene. I’m sure you have seen kayakers going down a river really fast wearing a life vest and headgear, tipping upside down and somehow they right themselves up and keep right on paddling. That is not what I had intended to do with my kayak, though if you plan to or not there are basic training strategies you need to learn before ever getting in the cockpit of your kayak. One of the most fearful mishaps is becoming trapped upside down in the kayak. This is why it is essential to have some basic training before your excursion. I taught myself most of the moves to learn by watching safety videos and with a friend attempting to, at first, get in the darn thing without to much trouble. Also what to do if you get inverted in the kayak. Remember I said the opening or cockpit as its called is 45″ x 18″, well I had no difficulty sliding out in the inverted position like I thought I was going to have. I did most of the training on a lake. Most outfitters will train for river adventures at a cost, and I would advise that you do before you attempt it. The Eagle Run kayak from Field & Stream delivers the performance when needed most. Whether good weather or bad I have had the most fun in this kayak. I love the camouflage blue that it came in and it has everything that I could possibly need. Some things worth mentioning is safety. You can never be too safe. Always use some type of flotation that is certified and if traveling down river wear headgear to protect your head from the rocks that you can’t see that can become hazardous. It is always a good idea to let someone know where your kayaking and when possible kayak with a partner. Considering the price of this kayak between $549 to $599, it is the best value for the outstanding performance it will give you. How Smooth is the Eagle Run Fishing Kayak? Knowing the smoothness of the Eagle Run fishing kayak is always a good thing. Not only do you want to consider how it is easily able to cut through the water with ease, but also how it performs, then here you have it!